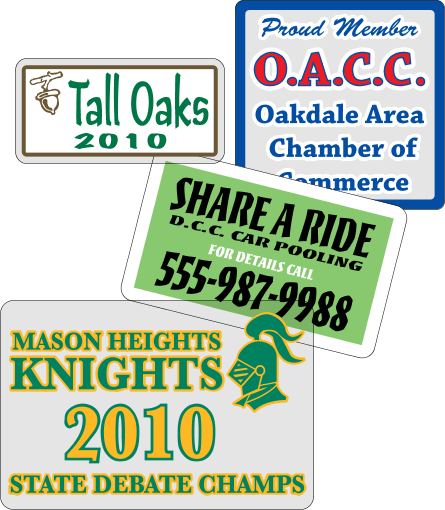 Custom Static Cling Decalsare commonly also referred to as "Clings" or "Window Clings". There are very common decals if you want something removable or temporary. Our main users put these decals in Cars, and Store Windows. Due to the length these decals are also used many times for election and campaign purposes. If you need aadhesive decal instead of static cling see; Clear Decals. There are 3 Main types of Static Cling Decals. Clear Face Adhering, Clear Back Adhering and White Back Adhering. Any combinations of colors and and print can work on one of these decal types. Most decals are "Face Adhesive" for inside the car window viewable to the outside world. Some are Back Adhesive; for example if you put a decal on a window of a soda cooler, put on the outside, viewable to the guest getting soda. Shipping: Most Static Cling Decals are produced in 4-6 Business Days! Savings: Ask about our Kwik-Ship Standard Sizes & Shapes that Save you Time and Money! Copyright � 2019 A Part of the 123Decal Network.